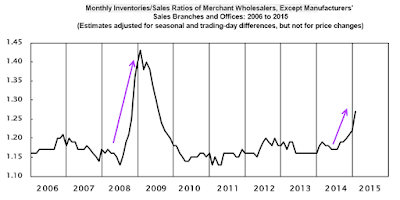 The US Commerce Department Monthly Wholesales Report for January 2015 shows sales are down while inventories continue to rise. Sales of nondurable goods were down 6.7% from last January. 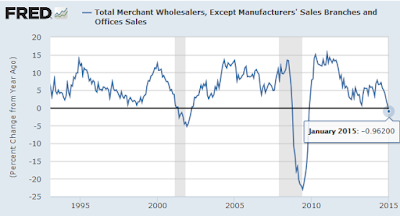 On January 31, I went Diving Into the GDP Report and noticed some ominous trends. Growth in fixed investment is falling rapidly. Equipment, industrial equipment, and transportation equipment are already in contraction. Inventories added 0.82 percentage points to fourth quarter GDP. 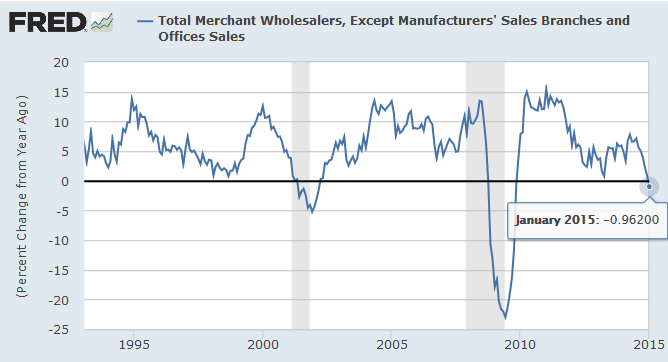 Over time, this series trends to zero, so expect a pull back next quarter. Rising imports subtract from GDP. Imports actually took 1.39 percentage points from GDP. If oil prices head back up, even modestly, this number could get worse. Exports added 0.37 percentage points to fourth quarter GDP. But note the trend. 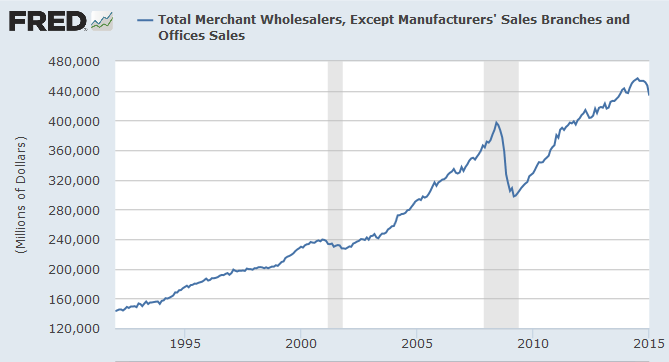 Because of the rising US dollar, export growth is dwindling. Will exports add or subtract to GDP next quarter? All things considered, this GDP report is far more than a simple snapback from the rapid expansion last quarter. Earlier today in Canada in Recession, US Will Follow in 2015, I stated "A Canadian recession is underway. US will follow." Let's return to a question I asked above: Will exports add or subtract to GDP next quarter? I suggest the answer is subtract. Not only are US exports getting more expensive relative to Europe and Japan, the entire rest of the global economy is slowing rapidly. Our biggest trading partner is Canada and Canada is in recession, with a rapidly sinking loonie (Canadian dollar) on top of it. The US won't decouple, just as China did not decouple from the global economy in 2008-2009 (a widely-held thesis I also knocked at the time). Indeed, now that virtually no economist expects a US recession, I believe we are finally on the cusp of one, just as the Fed seems committed to hike. I have been calling for lower and lower GDP estimates all year. 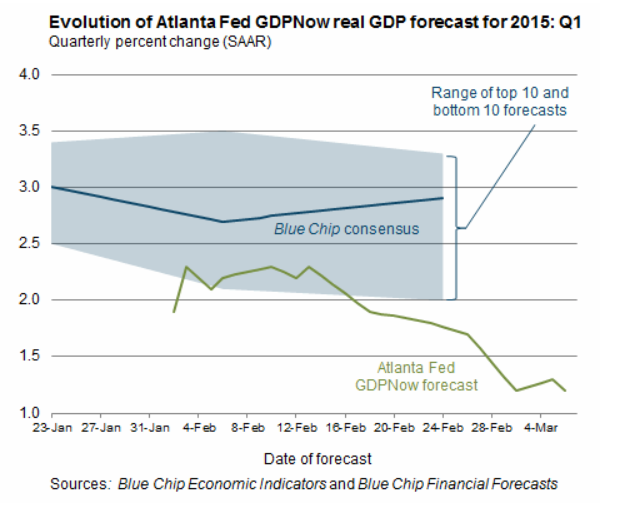 And here we go again with the latest GDP Now Projection from the Atlanta Fed. On March 5, I reported Factory Orders Unexpectedly Decline 6th Month. 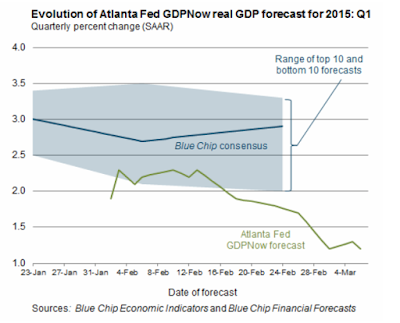 The adjusted Fed GDP forecast is rapidly approaching the stall point of 1%. It does take into consideration today's trade numbers. But the US dollar continues its upward climb and much of the world is still slowing including our biggest trade partner, Canada. 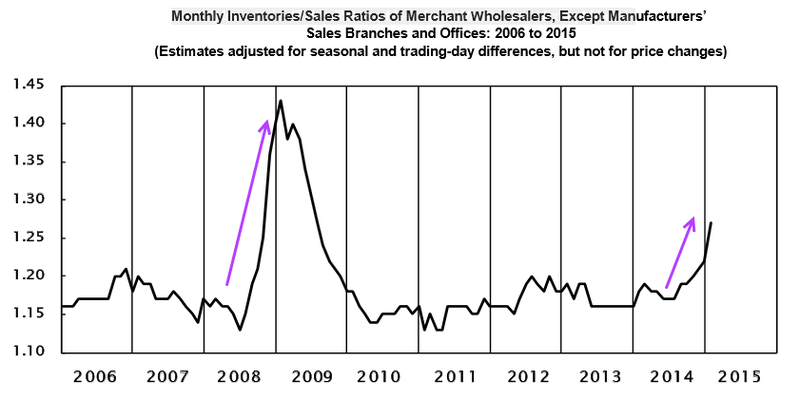 In the history of the wholesale trade series dating back to 1993 (first three charts above), the only time sales have gone negative year-over-year was when the economy was in recession. I am sticking with my recession call.